China Mobile has suspended account registrations for its Jego service, less than a month after it was quietly launched as a competitor to Skype. China Mobile International – a global-focused China Mobile subsidiary – announced the suspension of new account registrations for Jego over the weekend, and has also disabled Jego-to-Jego video and voice calls for customers who registered with a mainland China number and are located in mainland China. 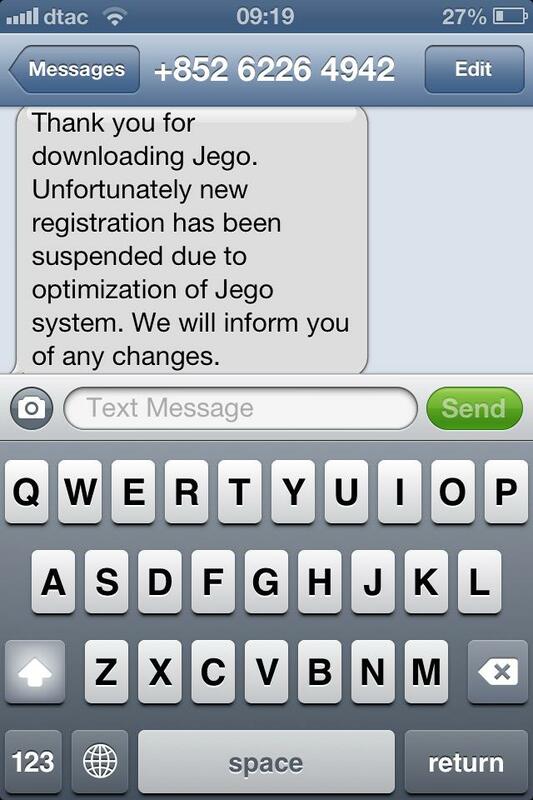 The company has posted a message on the App Store and Google Play saying new registration for Jego has been suspended due to “optimization” of the product and system and that it would inform users of any changes. We tried to open a new account but got a message as seen here. A Sina Tech report today said China Mobile has pulled the plug on Jego prematurely because the service is borne from its overseas subsidiary, not the mainland Chinese company itself, and this has triggered alarm over boundaries set by the government on Internet-based telephone services in China. We earlier reported that domestically Jego features messaging and Jego-to-Jego calling, but VoIP calling on Jego from China (if you’ve signed up with a Chinese number) to a Chinese landline or mobile phone isn’t available – down to the Chinese Ministry of Industry and Information Technology’s restrictive impositions on VoIP calls. Jego is an attempt from China Mobile — the world’s largest carrier, with more than 700 million subscribers — to answer the growing usage of messaging apps like WeChat, Viber and Line, and Microsoft-owned Skype, with an offering of its own. The app is available on Apple’s App Store and Google Play where it can be downloaded for free. Aside from features like free calls and text chats between Jego users, Jego gives users HD video calls and the ability to call any China-based number for just $0.022 per minute. That’s cheaper than Skype, which charges $0.026 per minute on a pay-as-you-go basis, in addition to a $0.049 connection fee.